In the lastest tournament, Team Florida Prospects 17U took second place in the Hoop Mountain Memorial event falling short to Team Florida in the finals 67-61. Playing without three key members of the team, who played with the 16U team, team Florida Prospects went 3-2 in the tournament. The team was led with exceptional play by Luis Jacobo who led the team in scoring averaging over 24 points a game. Jacksonville Jackson big man, John Brown continues to impress. Playing with a bad cold all week, Brown average a double double 15 points and 12 rebounds per contest. Newcomers Nick Mauge of Orlando Timber Creek and Jordan Freeman of Wekiva High played huged this weekend. Mauge came in and showcased a three point shot that was desparately needed for the team and Freeman's play was a pleasant surprise. "Freeman hasn't been playing basketball long but he came in and played with a great deal of energy. With time he can really develop into a good player." Florida Prospects AAU Director Todd Jenkins said. Team Florida Prospects 16U team playing together for the first Team Florida Prospects 16U team made it to the semifinals of the Hoop Mountain Memorial Event. "Our 16U team was a very pleasant surprise this weekend. The team played with great energy and the team enjoyed playing with each other. 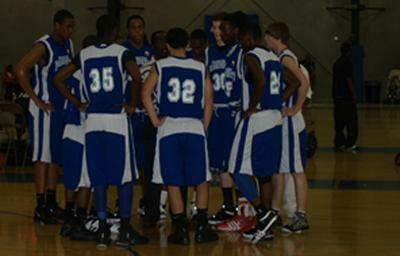 The team features a great mix of players who plays hard every minute they are on the court together." Jenkins said.